There was much Munchkin in the month of June -- over the last few weeks, we've released stuff to help store and to supplement your Munchkin collection! We do it because we care. And because if we don't, Spyke and Flower become sentient manifest beings and throw things at us. Store your Munchkin loot in style! These big boxes aim to contain your full collection of Munchkin merchandise, so there will be no more need to cart around stacks of smaller boxes. Each one has room for over 2,000 cards, a Kill-O-Meter, a Level Playing Field, some Dungeons and Seals, and anything else you use to enhance your games. There are three versions of the Monster Box to pick from, each illustrated by a different artist: Edwin Huang, Ian McGinty, and John Kovalic! You can choose your own cover at your local game store, or roll the dice and order online – a random cover, one out of the three, will be delivered to your door. Every monster box also includes six reprinted Munchkin promotional bookmarks and ten reprinted Munchkin promotional cards. Treat your treasure like gold! Take good care of all your loot with this fabric 14" by 28" playmat. It helps you organize your Class, Race, level, and all your gear – and Flower tosses in some extra gold when you sell items! The mat features a cool illustration, from the pencil of Edwin Huang, of Flower atop her huge hoard. The world may be ending . . . but the fun is just beginning! Len Peralta is known for his Geek a Week trading cards and the Ten State comic book. And he's illustrated Munchkin before, creating artwork for Munchkin The Guild and the recent Star Munchkin Guest Artist Edition. Now he's back with more guest artistry on Munchkin Apocalypse Guest Artist Edition! The game features a unique circular gameboard and completely re-llustrated game cards. It's available exclusively at Barnes & Noble. The world won't necessarily end if you don't play this game, but we can't guarantee that it won't. This summer, the world will end . . . again. Okay, so the world didn't end yet. It can't, because there's got to be a sequel. 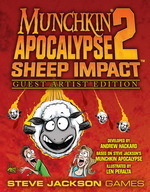 For the first time, a Munchkin guest artist tackles an expansion with Len Peralta's Munchkin Apocalypse 2 Guest Artist Edition. You can go up against mutants, bandits, and the Seals of the Apocalypse, all with brand-new art. This expansion is also exclusively at Barnes & Noble. So entertaining, it's got to be from another plain. 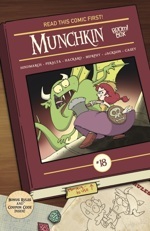 This month's edition of the Munchkin comic book features a bevy of beloved Lovecraftian tropes, none of which can stand against the practical monster-killing and treasure-grabbing tactics of Spyke and Flower. With art from Len Peralta and storylines from Will Hindmarch, Andrew Hackard, and Steve Jackson, it's a shot of classic Munchkin fun you can take even when there's nobody to play with. The Doom That Came to Munchkin . . . The Great Old Ones are great and old and all, but what if they looked more like they should be called the Great Chibi Ones? Find out the answer in a game that will leave you both squealing from cute and screaming in terror! 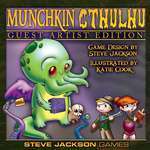 My Little Pony comic illustrator and Gronk creator Katie Cook brings a cute, dewy-eyed style to Munchkin Cthulhu Guest Artist Edition. Her illustrations give us a brand new take on the original Lovecraft-themed game – you'll get to see what an otherworldly monster looks like when it's both adorable and eating your items, for example. Be like the legendary heroes . . . at least until it's time to betray your friends! 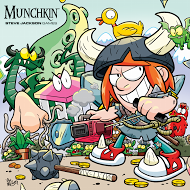 A frequent illustrator of Munchkin comics comes to a Munchkin game! Mike Luckas is known for his work on Skullkickers (and Munchkin Skullkickers) as well as Munchkin comics, and for his webcomics Conquistas and Das Moustache. His fun cartoon-style images bring us a new take on cards like the Minotaur, Atlantis, and a Digital Cloak. This Target-exclusive game is on shelves. Don't miss the call of destiny; go play it! The Ogres are still huge . . . but this game isn't! 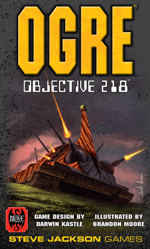 This brand new card game joins the future combat of Ogre with the gameplay of the modern classic, The Battle for Hill 218. The weapons in 2085 A.D. are still fast and still deadly, but the game is smaller and quicker to play than classic Ogre, which makes it the perfect introduction to the universe for you and your friends.